Sometimes, have you ever noticed, our personal truths are so odd, so out there, that we hold them tight in our hands in an odd mix of wonder and fear. Sometimes our truths are hard to talk about. Even though we know them to be true we know that they fall so far outside people’s expectation that we’re afraid we won’t be believed. So we don’t talk. We hold them tightly to our chests and gently hope them soon buried. 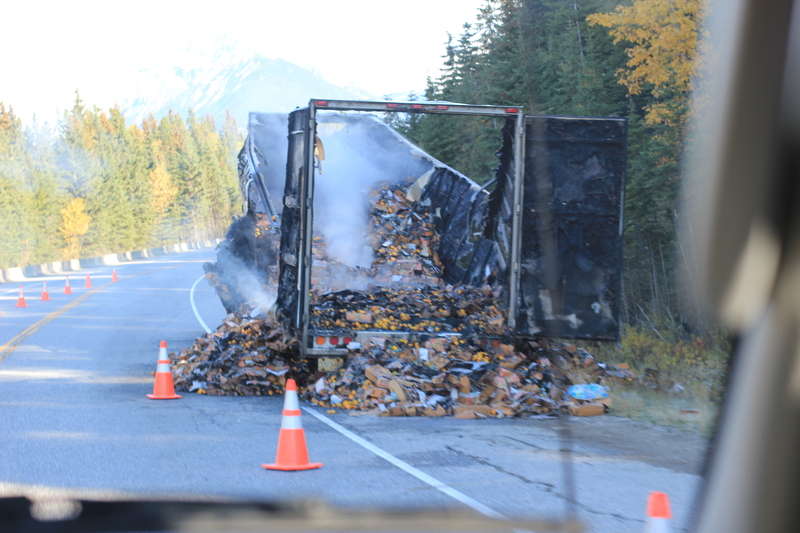 Here is a truth from my life, one that is so strange I found it exceedingly hard to believe: when we were in the Canadian Rockies last October we drove past a truck full of mandarins that had caught fire. Yes. The truth. I know. Weird, isn;t it? For one thing, when has anybody ever seen a flaming mandarin truck, and for another thing, what on earth was a truck full of mandarins doing driving in the Canadian Rockies? We talked about this a lot amongst ourselves, but after a while we stopped. We didn’t share it, even though it was the truth, and no amount of wondering why such a strange occurrence could happen would answer our questions. Sometimes you need to learn to live with contradictions. The other day my aunt and uncle came to visit. I hadn’t seen them for a long time, and we got to talking about our trip, and showing them photos of the things we did and the places we saw. And lo and behold, up on the computer came the photo of the smouldering mandarins, and we told our story and expressed our incredulity at this our odd and incomprehensible truth. We stared, open-mouthed, at her for a minute. Our strange truth was believed, and, not only that, it had a reason. What we couldn’t comprehend was comprehensible to someone. I’ve thought a lot about that mandarin truck again since that day, and allowed the truth to seep deep down into my story, allowed the strangeness to become normal. In that process I’ve been reminded of other truths I’ve held close to my chest, things that have been too personal and too odd for me to ever talk about, and how other people’s stories have helped me recognise the truth of my own, have validated them, justified them. I remember movies I’ve seen, books I’ve read, that express uncomfortable truths I thought were known only to me, and how those books, those movies, have made me feel less alone. So this, my friends, is the story of my mandarin truck, and my reminder to you, and to myself, of why it’s always important to tell, to read, and to listen to, stories. I have a friend who looks like the young Bridgette Bardot. No joke. In fact there’ll be people reading this blog who know me in my real life (in which I am fairly boring and don’t actually say that much, but that’s another story) who’ll look at this photo and say “Wow, is that…” although I won’t say her name here, because that would just be awkward. And it’s not. It’s Bridgette Bardot (with plenty of clothes on). But, you who are reading this and know who I’m talking about, you’re getting it too, right? It’s weird being friends with someone who looks so much like a supermodel. I’ve learned to deal with it better over the years as I’ve grown more comfortably into my own skin, and got to know her better as well. I know her well on the inside, and I see right through the outside these days, but early on, when I first met her, I found her beauty confronting. Have you ever experienced that? Is it just me? I’m pretty sure it’s probably a girl thing, so I do apologise to all the blokes out there reading this who are thinking “what?” but never mind. Ask your wife, or your girlfriend. Or your sister. See what they say. Or go hang out with Pierce Brosnan for a few days and see how it makes you feel. Beauty can be challenging. Sometimes I feel the same way about being in someone’s beautiful house. Here’s the truth though: I have as much right to a beautiful house as the next person. Here’s another truth: my Bridgette Bardot supermodel friend doesn’t see herself as beautiful at all. And another truth: another of my precious friends tells me she sometimes picks up jeans from the rack that are much too large for her, because that’s sometimes the size she sees herself as. And, conversely, I,who used to be skinnier, sometimes pick up jeans that would have fitted me ten years ago. I look at myself in the mirror every single day. 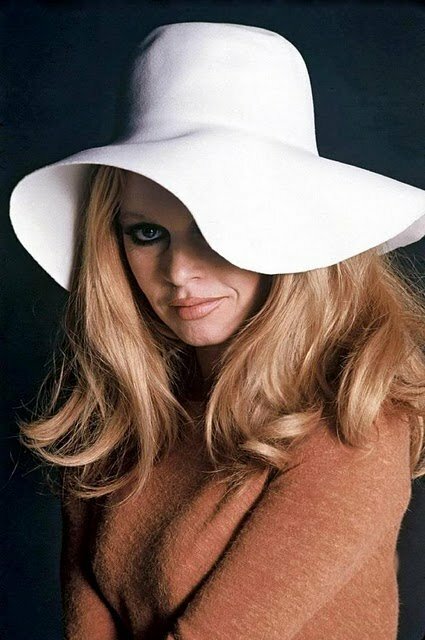 So does my Bridgette Bardot friend. Every single day, yet we still don’t get it. The ugly truth is this: we lose the ability somehow, somewhere, to see ourselves as God sees us: as fearfully and wonderfully made; as precious and honoured; as beautiful simply because we are made in His image. Yet This. Is. What. We. Are. We are robbed from the truth by beauty magazines, by television, the internet, by the lies we listen to in our own minds. It’s time, for me at least, to acknowledge and grow beyond it. It’s a new week. Do me a favor, take a minute today to acknowledge yourself as beautiful. Yes you. I’ll do it too. Now come back and tell me how you go. Here’s the truth: it’s been a big week. I do apologise for not blogging on Friday when I’m trying to be consistent in these things, but there’s no denying it: between sickness and health and estrangements and reconciliations and house moves and some other really quite big things, it’s been a big week. And…I did it. It. The thing I blogged about a little while back, my Small Dream. Alongside sickness and health and estrangements and reconciliations and big weeks. It went well. Actually, I loved it. I didn’t want to leave and then I cried on the way home and if I could put my whole life and sickness-and-health-and-estrangements-and-reconciliations-and-house-moves aside and just stay there for the next two weeks I would. It wasn’t easy by a long shot, and to tell you the truth this week I’ve had to deal with some of the deepest truths of who I am and how I’ve seen myself and, more importantly, why I’ve held those beliefs about myself for so many years. There have been tears. You don’t do change without it. You don’t do life-stage changes and moving forward into new one without some grief about the past and the things you’ve lost, or the opportunities you didn’t know you had until they were gone. You need sometimes to face the truth, hard though it may be, and give it the time and space it needs. Here’s another truth: sometimes the time and space grief needs is shorter than we allocate it and we don’t know how to let it go. Ouch. (come on, you know you want to!) This is why we believe – or need to – in something bigger than ourselves. It’s because living is, after all, quite fun. Because, when all is said and done, we all think we’re too fat or too skinny, too intense or too shallow, too fearsome or too foolhardy and too…too anything for anyone to really love us if they knew. It’s truth, right? And it’s because we know it, and because we know all about our own failings and insecurities that we’re free to love those around us in spite of theirs. You know it’s true. I actually don’t care about the way you flip your hair or stare at the ground (and if you don’t understand that you’ve obviously not been dancing like a maniac to One Direction in your kitchen lately – or you don’t have an 8 year old), but I do want you to know one thing that’s true: whether you know it or not, you are beautiful. And that’s God’s honest truth. I never considered myself anything of an oil painting, to borrow an old phrase. In fact, if I was a character in an Agatha Christie novel I’d be considered “homely” rather than “comely”. And that’s okay. That’s me. My six year old son, however, believes differently. He says to me yesterday “Mummy you’re SO pretty. Every single day I see how pretty you are”. The child is six. He knows how to lie (“No, Mummy, it wasn’t me who spilled all that water out of the bath. I’m sure it was Daddy”) but he has no idea how to lie well, so I have no choice to believe that what he says is – at least in his mind – true. Made me remember though just how powerful words can be, for good as well as for bad. I wrote in Monday’s post about a parcel of criticism that was delivered to me when I was young, and over the past few days I’ve realised what a forest of mighty oak trees grew from the little acorns in that parcel, from the words that I had no choice but to believe about myself. It feels good to look at those trees and know they are not part of me, and bulldoze them down. It makes me hyper-aware, too, of the language I’m speaking over my kids, especially when I’m mad at them. My hair isn’t as red as the “me” in the painting, but my cheeks are. 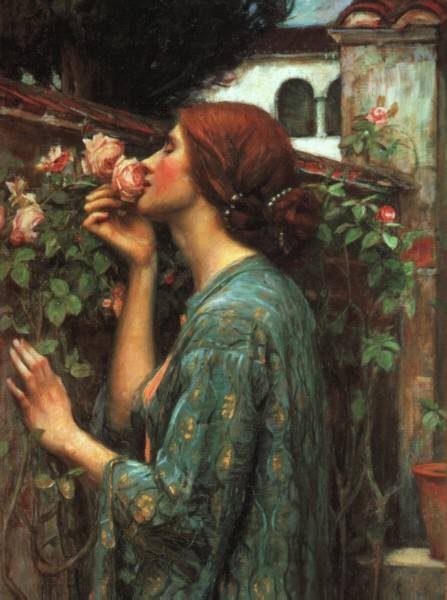 And yes, I do wear as dippy a face as that when I’m sucking the life out of the smell of roses. I’ve been teased about both of those things over the years, and thrown words that would try to mold me into somebody else’s idea of who I should be. Words don’t go easily, but I can get rid of them, and the thing I find is that when those mighty oak trees finally fall the ground where they were is rich and fertile for the me that I was all along underneath to grow.